Happy Birthday, Rome, from the Antonine Wall. It’s April 21st, the traditional founding day of the city of Rome when, according to legend (one of them, anyway) Romulus ploughed a furrow laying out the boundaries of the city, sacrificed to the gods and became the first king of Rome by popular acclaim. Ancient sources vary on the date of this mythical event (in fact, archaeological evidence indicates Rome has been inhabited since Paleolithic times, ca. 14,000 years ago) but for the past couple of thousand years the most widely accepted date for the founding is 753 B.C., which makes the Eternal City 2,772 years old today. 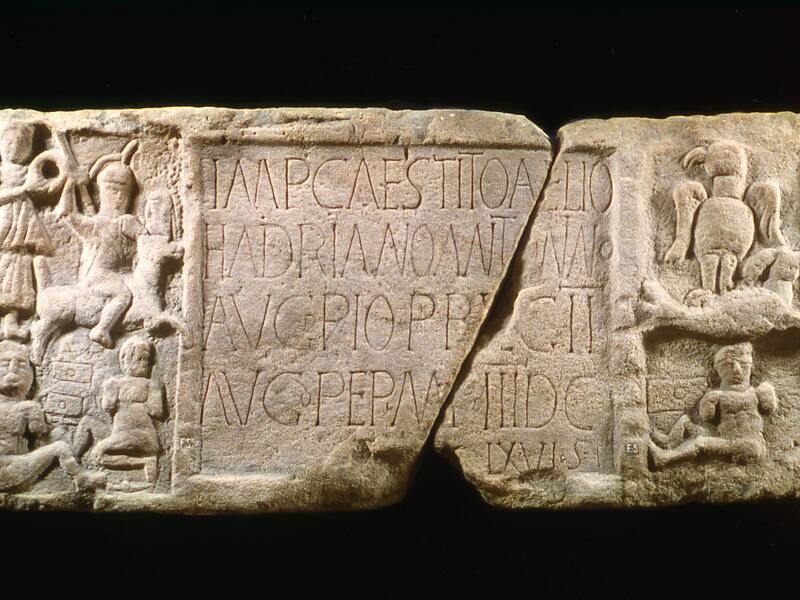 It was a comparative baby of 895 years old when its legions built the Antonine Wall across the width of Scotland, a series of defensive ramparts, ditches and forts marking the furthest northwestern boundary of the empire. The soldiers left distance stones, slabs with reliefs and inscriptions documenting how much of the wall they’d built, features unique to the Antonine Wall. 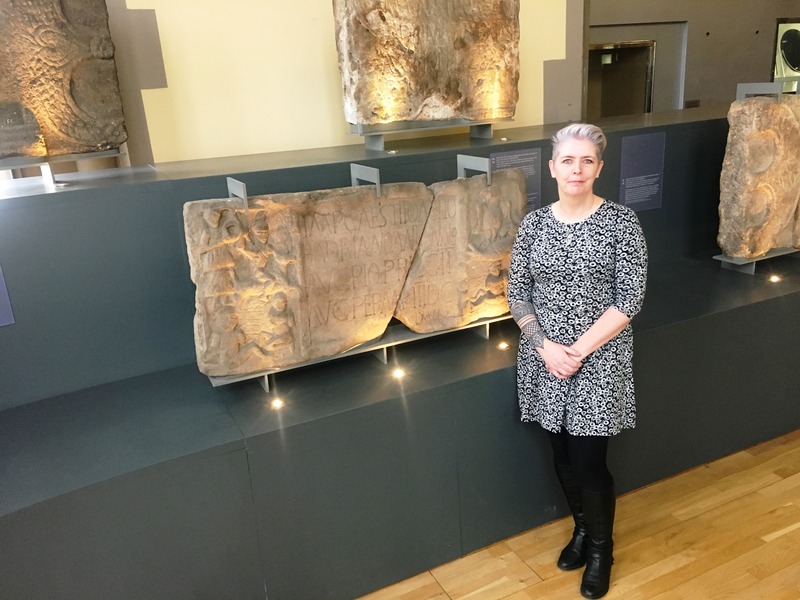 A new study by University of Glasgow archaeologist Dr. Louisa Campbell has found that those distance slabs, now worn down to their natural sandstone, were originally painted in bright red and yellow. She used X-ray and laser technology to analyze the Second Legion’s distance stone, found at Summerston Farm in the 17th century. Inscribed with a dedication to Antoninus Pius (“For the Emperor Caesar Titus Aelius Hadrianus Antoninus Augustus Pius, father of his country, the Second Augustan Legion completed [this work] over a distance of 3666.5 paces”), the stone depicts Roman cavalry with two captives on the left of the inscription, and an eagle on top of a capricorn (emblem of the Second Legion) on the right. It is currently on display at the University of Glasgow’s Hunterian Museum. Dr. Campbell used portable X-Ray Flourescence and Raman Spectroscopic technology to analyze the traces of pigment remaining on several distance stones, including the Summerston stone. They identified a limited palette of vibrant red and yellow that was used as visually impactful propaganda that would have conveyed a clear message to indigenous peoples about the power and strength of the Roman empire. There is even evidence for red on the beak of the Roman eagle which Dr Campbell suggests symbolises the eagle feasting on the flesh of her enemies.